We wanted to go for a more D&D inspired design with the Gnolls, giving them a wild, feral look with emphasis on strength and size. I wouldn't want to get too close to this guy! Love the emotion of your Gnoll, I feel as though you captured it perfectly. Very badass. Nice and dynamic! 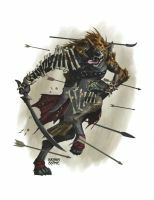 I love gnolls. Can I make this as a Yugioh card,and tell people that the artwork is yours? You'd need to ask Mikedeangelo, he owns the reproduction rights. This guy looks like quite intimidating. Great work.